3in5 small touchscreen display front module Backlight LED Color TFT LCD. Display size: 3.5 inch. 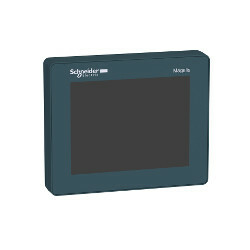 3in5 small touchscreen display front module color TFT LCD without Schneider logo. Display size: 3.5 inch. 5in7 small touchscreen display front module Backlight LED Color TFT LCD. Display size: 5.7 inch. 5in7 small touchscreen display front module color TFT LCD without Schneider logo. Display size: 5.7 inch. 3”5 color touch controller panel - Dig 16 inputs/10 outputs. Product or component type: Small touch HMI controller. Display size: 3.5 inch. 3”5 color touch controller panel - Dig 8 inputs/8 outputs +Ana 4 In/2 Out. Product or component type: Small touch HMI controller. Display size: 3.5 inch. 5”7 color touch controller panel - Dig 16 inputs/10 outputs. Product or component type: Small touch HMI controller. Display size: 5.7 inch. 5”7 color touch controller panel - Dig 8 inputs/8 outputs +Ana 4 In/2 Out. Product or component type: Small touch HMI controller. Display size: 5.7 inch. 3”8 monochrome controller panel - 12 inputs/6 outputs source. 3”8 monochrome controller panel - 12 inputs/6 outputs sink.